In ‘Hacking the piano’ the string instruments of Tiptoe Company & ChampdAction are confronted with the piano as a sound object. The performers engage in dialogue with ‘piano hackers’: artists/composers who each have an original relationship to the keyboard instrument. They still use the piano, but have rebuilt the instrument in accordance with their own creative needs (Tim Mariën). At the same time, tools such as sound amplification and ‘live electronica’ are used (Patricia Alessandrini). A ‘virtual instrument’ is created alongside the physical instruments and performers. 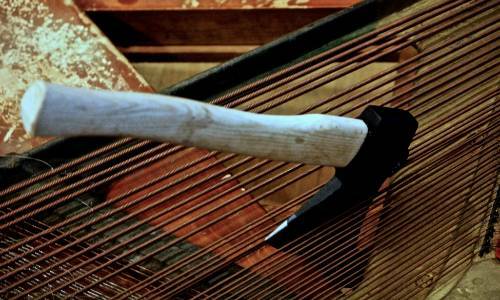 ‘Hacking the Piano’ is part of ChampdAction’s focus on innovation, interdisciplinarity and technology. For this, the production house for contemporary music is collaborating with in-house artists like the young players of Tiptoe Company. Tearing apart classical instruments to create an entire new motorised universe is the red thread through this installation concert with ‘In spite of, and maybe even therefore’ by Simon Steen-Andersen, ‘Pietà’ by Lisa Streich, ‘schwingende Systeme, B’ by Michael Maierhof and a new work for high voltage relays and ensemble by Alexander Chernyshkov.